A while back Apprising Ministries brought out that today, sadly, there are so many in the apostatizing evangelical community who are burying their heads within the spiritual sand of whatever offshoot—rooted in the semi-pelagian Church Growth Movement—it is that is highjacking their particular brand of Christian sandbox. So while apostasy sweeps through the landscape of the visible church they remain content to think everything is wonderfully progressing toward some utopian unity as they each follow their own personal Pied Pipers, whether it be PDL Pope Rick Warren or Rob Bell, the Elvis of the Emerging Church, or Joel Osteen for his brand of Word Faith-lite. The sad fact is that mainstream evangelicalism in America today is nauseatingly lukewarm; and far too many evangelical leaders have been unwilling to take serious theological stands, which would require the Lord to back up His Word or else they would personally be destroyed. Yet to do so is not presumption, rather, it’s actually true Biblical faith that pleases God. Now we have the rise of the Seeker Driven/Purpose Driven church planting prophet-pastor ala Steven Furtick of Elevation Church. I told you in Steven Furtick And James MacDonald that he’s even blessed by Church Growth gurus, Purpose Driven Pope Rick Warren and Bill Hybels. 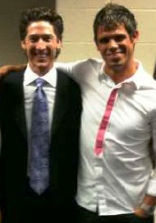 Then the other day I posted “The Steven Furtick Show” Played At Harvest Bible Chapel Of James MacDonald. 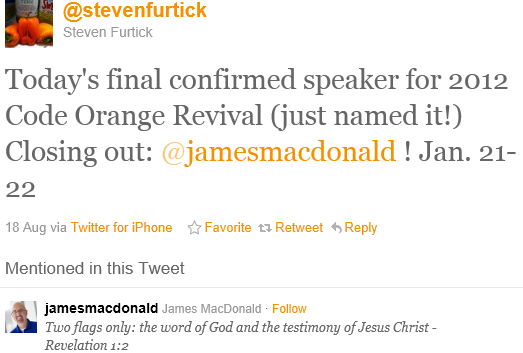 With Acts 29 YRR preacher Matt Chandler also on the platform, it would appear MacDonald has—for whatever reason— opened the dor for Furtick to further invade that sector, not unlike John Piper has done for Rick Warren. As I’m attempting to alert you to, this is more example of a growing syncretism spreading throughout even the mainstream of evangelicalism. Here’s a few examples of what to expect.